Go Bigger: that was the goal of director Francis Lawrence when he shot The Hunger Games: Catching Fire. So what better way to go big than to go IMAX? Specifically, Lawrence and his camerapeople used three IMAX 15 perf/65mm film cameras to shoot climatic action sequences in the arena. “These are the highest resolution cameras in the world, providing approximately 10x more resolution than 35mm film, which results in breathtaking crispness and clarity on screen,” Murray said. The effect: As Katniss (Jennifer Lawrence; no relation) enters the arena, the screen image expands vertically to fill the IMAX screen. “That is such an incredible moment to choose to go into IMAX, when she’s coming out of this, because she’s seeing this new world,” said Jennifer Lawrence in the same IMAX Behind the Frame featurette. 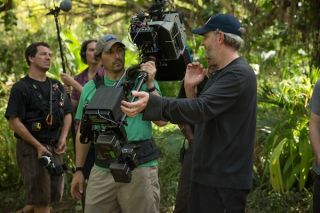 It wasn’t always easy shooting Catching Fire in IMAX: “The near 100lbs weight of the camera rig made moving it around more difficult than a traditional 35mm setup,” Murray said. As well, the crew had to work at maintaining visual consistency between the 65mm IMAX and the 35mm handheld shots. IMAX also helped the Catching Fire’s filmmakers digitally-remaster film sections not shot in IMAX, by using the company’s IMAX DMR process. To muscle up the audio mix, IMAX’s people went back to the film’s stems (the individual groups of audio tracks that are combined into the final mix), so that the soundtrack could be pumped up for IMAX playback. The result: A final mix that is as heart-pumping as the larger-than-life IMAX visuals on screen. For Hunger Games fans, the IMAXing of Catching Fire has achieved Francis Lawrence’s goal to go bigger the second time around. Achieving this goal required a close collaboration with IMAX from start to finish: “It’s important to note that we work alongside the filmmakers throughout this entire process as our main objective is to help them achieve their creative vision,” Murray said. Judging by the reviews, the collaboration worked.